On 15 August 1549 the first Jesuit missionary, Francisco Xavier (1506–1552), arrived at Kagoshima, on the southern coast of one of Japan’s four main islands. At the time, the country was fraught with civil wars and was divided into small territories governed by their local lords. Following Xavier, dozens of European missionaries, mainly Jesuits, visited the country and actively pursued their evangelical mission. Christianity soon gained popularity among this population devastated by famine and war. The strategy of the Jesuits in targeting important local lords to convert their subjects was effective by and large. The mighty lord, Nobunaga Oda (1534–1582), was a potential unifier of Japan. Fascinated by Western technology and commerce, he tolerated evangelical activities in the capital and almost aligned with Christianity. But a conspiracy led to his untimely assassination when he was halfway to victory. His immediate successor, Hideyoshi Toyotomi (1536/37–1598), alarmed by the growing power of the Christians, started to oppress them. Through several acts published by the successive governments, namely those of 1614 and 1639, Christianity was gradually swept away from open practice and became clandestine. The rise and fall of the first Christian presence in Japan spanned the hundred years from 1549 to ca. 1650, inspiring the late historian Charles Boxer to call this period the “Christian Century.” It is exactly during this period that the country experienced the first direct encounter with Western culture and civilization. About 30 years after the arrival of Xavier, Alessandro Valignano (1539-1606), the “Visitor,” determined the basic policies of the mission in Japan. Under his supervision, the Jesuit institution for higher education, called the Collegio, was founded in Funai in the province of Bungo (now Ohita) in 1581. Another important figure, the Spanish Pedro Gomez (1533/35-1600) started to teach there in 1583 by elaborating courses and writing textbooks. After 1586, escaping local unrest and civil war, the Collegio moved to places such as Shimabara and Amakusa and eventually settled in the harbor town of Nagasaki. Meanwhile, an embassy composed of four young men (Mancio, Julian, Miguel and Martino) among the students of the Collegio was organized and left Nagasaki for Europe in 1582. The embassy reached Rome in 1585 and met Pope Gregory XIII. Upon its return to Japan on 21 July 1590, the embassy brought back metallic typesets and a printing machine. Not only catechism and the theological doctrines of the Roman Catholic Church but also broad Western natural philosophy, including psychology based on Aristotle’s teachings and cosmology owing to Ptolemy’s system, were taught at the Collegio. 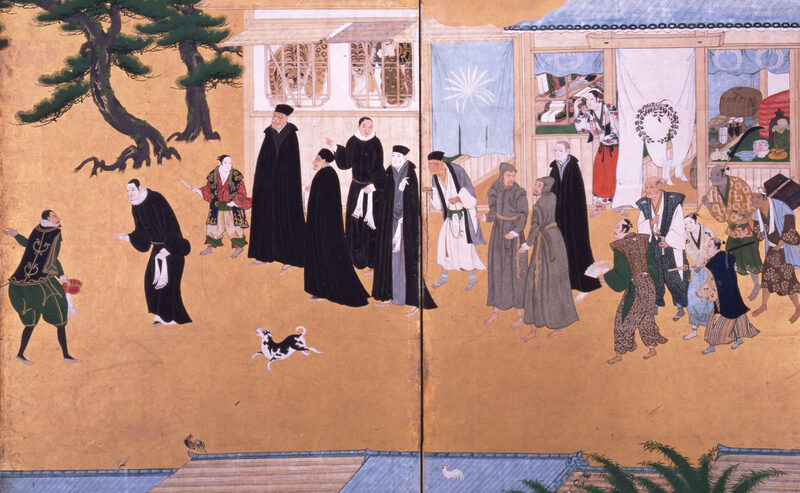 The intellectual life of the Jesuit missionaries and their Japanese students at this institution mainly involved the composition of teaching materials and the translation of European works for evangelization and education as well as their printing and publication. Within a few decades, many texts were produced. Over 30 of them are known and extant today. At the apogee of this intellectual activity, a treatise entitled Fides no Quio was published at the printing house of the Collegio of Nagasaki in 1611. According to the correspondence of several Jesuits, its print run ended around November 1613. In 1614 the government published an act against Christianity (estimated to number over 300,000 believers by then) and especially targeted the Jesuits. All missionaries and influential Christian figures, including the lord Ukon Takayama (1552–1615), were exiled to Macao or Manila with their precious printing machine. Most of the primary sources related to this intellectual movement were written in Latin, Portuguese, Spanish, Italian or Japanese. In these documents, many topics and themes characteristic of Renaissance and early modern European history can be observed. The study of these texts from the point of view of intellectual history has just begun. Rich discoveries surely await scholars.